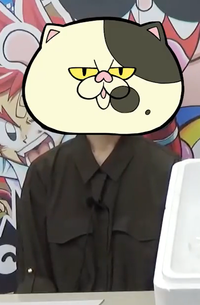 Sankichi with a Judd head to cover his face. Sankichi Hinodeya (ひのでや参吉 Hinodeya Sankichi) is the creator of the Splatoon manga who worked on Kanitama-Kun, Arincho-Kun, Mega Man, and The Dempa Men before being attached to the Splatoon characters so much that he had to work on the Splatoon manga more. Sankichi joined Twitter on September 2010, posting a sneak peek of Kanitama-Kun. He posted a first look at a manga for Splatoon on April 2015 and in May 2015, he made the very first and unoffical issue of the Splatoon manga and was seen in June's CoroCoro issue. Sankichi made and published another one-shot Splatoon on December 2015 and was in CoroCoro's December issue as well. He is the only Splatoon worker/fan in the CoroCoro video who's face is not shown, presumably for privacy reasons. This page was last edited on 3 April 2019, at 20:18.